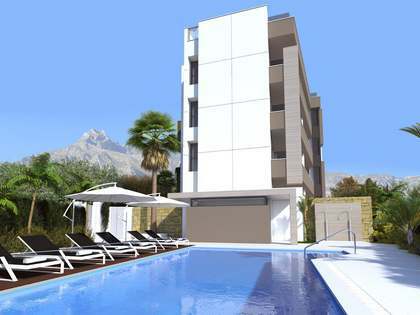 This property is part of the Elegant modern beachside apartments Marbella. 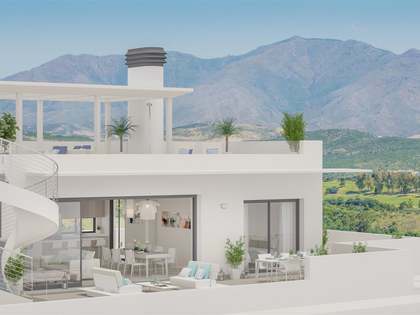 Exquisite development of 24 modern apartments and penthouses with 2 bedrooms, 2 bathrooms, a garage parking space and a storage room each, as well as fabulous communal facilities, in East Marbella. 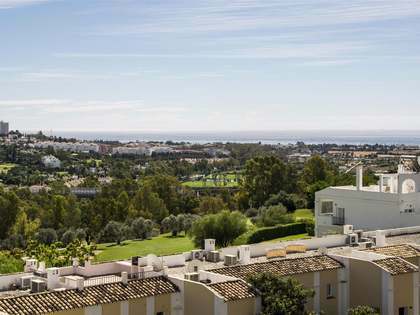 Exquisite 2-bedroom apartment in a modern new beachside development with fabulous communal facilities and a parking space and storage room included, East Marbella. This exclusive apartment is situated in an elegant new development in East Marbella, surrounded by a beautiful natural environment and just a 5-minute walk to Cabopino, one of the best sandy natural beaches on the coastline with sand dunes, as well as being close to golf courses and Cabopino sports port. The avant-garde buildings only have 3 floors and the complex boasts an exclusively designed swimming pool and chill out areas with wooden pergolas, a gym and functional room. This particular property measures 82 m² and has an 8 m² private terrace leading off of the living area. It has a double bedroom with a separate bathroom and an en-suite master bedroom, open plan living spaces with direct access to the terrace and the kitchen is fully fitted with top end appliances and unique Island-Dining countertops. Underground garage space and a storage room included in the price of the property. This apartment is energy efficient, using innovative quality materials. Indirect LED illumination, high ceilings and doors, floor-to-ceiling L-shape windows, mirrors and seamless fitted wardrobes with floor-to-ceiling doors are just some of the special features of this property. Home automation control for the lighting, air conditioning and the alarm system, solar panels for domestic as well for community hot water, and much more is provided. Elegant, modern beachside apartment in East Marbella.